What is the minimum speed at which a source must travel toward you for you to be able to hear that its frequency is Doppler shifted? That is, what speed produces a shift of 0.300% on a day when the speed of sound is 331 m/s? This is College Physics Answers with Shaun Dychko. We're going to calculate what minimum speed the source must be approaching an observer in order for the doppler shifted frequency to be detectable. So, that means the percent change in the frequency has to be at least 0.3 percent, or the fractional change has to be 0.003. So, the observed frequency is the source frequency times the speed of the wave divided by the speed of the wave minus the speed of the source. And, it's a minus when the source is approaching the observer. So, in this fraction here, we're going to divide both factors by the denominator, so that's F observed divided by F source minus one, because F source divided by F source is one. And that is 0.003. And then, we'll replace this with Vw over Vw minus Vs because the observed frequency is the source frequency multiplied by this fraction. And then, we're dividing by F source. And so, we end up with just the fraction. So we have Vw divided by Vw minus Vs minus one, that's 0.003. Now, our job is to solve for Vs. And, we'll add one to both sides, and we get Vw over Vw minus Vs equals 1.003. And then, multiply both sides by the denominator. And, you get this line here. So the wave speed is 1.003 times wave speed minus speed of the source. And then, distribute the factor into the brackets, and you get 1.003 Vw minus 1.003 Vs. And, it will add 1.003 Vs to both sides. And also, subtract Vw from both sides. And you end up with this line here. And then, lastly, divide both sides by 1.003, and you solve for the speed of the source. 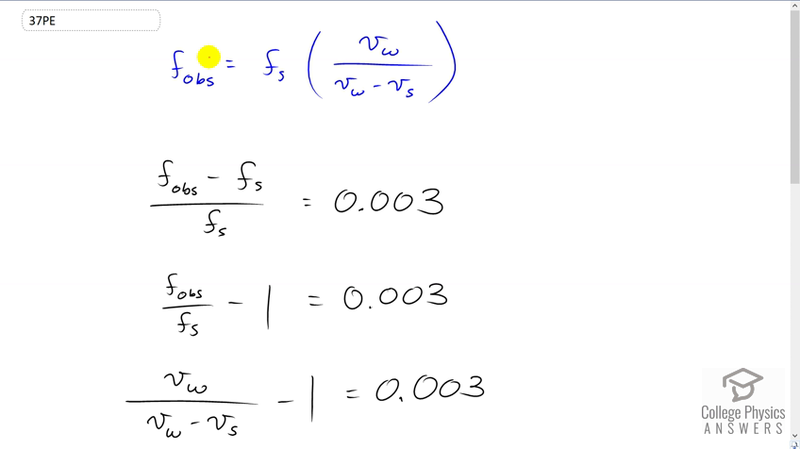 So, the speed of the source is 0.003 Vw, because it's 1.003 Vw minus one Vw, which makes 0.003. So, that's 0.003 Vw over 1.003. So, 0.003 times 331 meters per second, the speed of sound in this particular day, divided by 1.003, which gives us the speed of the source of 0.990 meters per second. And so, if it's moving towards you any slower than that, you will not be able to notice the shift in the frequency due to the doppler because the shift will be too small. And, if it's moving towards you faster than this, you will be able to notice it.